What’s up with my fascination of weeds? 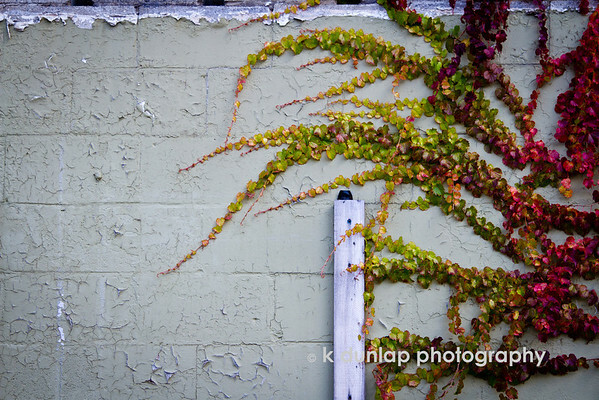 I was driving by and saw this extraordinary vine growing across this urban retaining wall and had to turn around to photograph it. I was amazed by the variation and vibrant color. I thought it was just stunning. There I was standing in an empty gravel lot photographing a wall of weeds. People driving by must have thought I was crazy. Heck, maybe I am a little, but I don’t mind. Glad you stopped for this -- it is so very interesting! What a unique sighting.......super capture, K!!!! Actually, not a weed. It is Virginia creeper, which turns that spectacular red in autumn. Nice shot, though! These don't look like weeds, they are very interesting & pretty. I LIKE it!